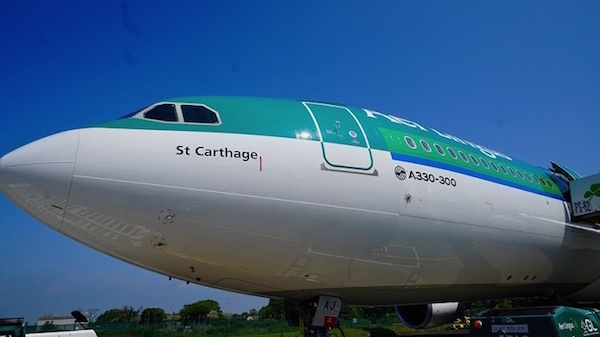 Aer Lingus has welcomed a brand new Airbus A330-300 into its fleet. The new A330 aircraft, named Saint Carthage, registration EI-GAJ, has a total capacity of 313 seats, which is made up of 30 business class seats and 283 economy seats. It is scheduled to make its first commercial voyage on Aer Lingus flight EI109 from Dublin to New York JFK. Aer Lingus now boasts a fleet of 63 aircraft with 15 of these servicing its long-haul network. The newly-received A330 aircraft represents a significant investment by Aer Lingus in its transatlantic network and this summer it will operate its largest ever transatlantic schedule flying to 11 North American destinations. A new route Miami joins Aer Lingus’ existing transatlantic routes Boston, Chicago, New York, Orlando, San Francisco, Washington and Toronto from Dublin and Boston and New York from Shannon, as well as Los Angeles, Newark and Hartford, which commenced last year. This summer will see Aer Lingus also increase its Los Angeles service to a daily flight for the peak season, Dublin to Orlando will increase to four times per week, and Chicago will also increase to a double-daily service in the same period. Aer Lingus’ transatlantic growth is an integral element of its successful strategy of expanding its Dublin Airport base into a major European transatlantic gateway. While traditionally Aer Lingus connected Irish residents to North America, today more than a third of Aer Lingus transatlantic guests begin their journey in the UK or mainland Europe connecting via Dublin. Declan Kearney, director of communications, Aer Lingus, commented: “The delivery of a new aircraft, particularly an A330, always creates a wave of excitement across the airline and represents a significant investment for Aer Lingus in growth, in our guest experience and in Dublin as our transatlantic gateway. “Summer ‘17 will be our busiest on record and the new aircraft will join our long-haul fleet operating 13 routes between Ireland and North America including Miami, where we will begin flying in September. “Aer Lingus remains committed to growing our transatlantic network and connecting Ireland and Europe to even more destinations across North America.